Birds — and nature lovers — flock to state reserve on Carmel Bay. POINT LOBOS, Calif. — The birds were break dancing. That’s the best description I can give for the strutting, bobbing and tail-fanning spring mating ritual of the Brandt’s cormorants I was watching through a spotting scope. They crowded a guano-whitened rock near aptly named Bird Island, just one of many natural wonders in 3,400-acre Point Lobos State Reserve. California gets more than its share of hype, but here’s where it earns its superlatives. 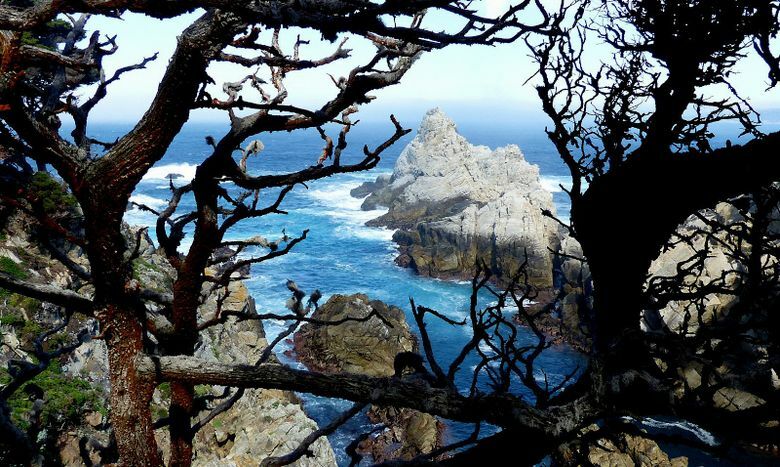 Point Lobos, three miles south of Carmel, is some of Earth’s prettiest coastline. Point Lobos State Reserve is off Highway 1 about 20 minutes south of Pacific Grove, Calif. Admission: $10 per car. Opens at 8 a.m. year-round; closing time varies seasonally. It’s a highly popular site with limited parking. In summer and on holiday weekends, expect overflow crowds; arrive early (by 9:30 a.m.) or later in the day (after 3 p.m.) to avoid waits at the gate. Pick up a helpful $2 trail map at the entry. On the Central Coast, off Highway 1 on the way to Big Sur, it’s a treasure of sea-sculpted rocks and roaring, menthol-blue sea that surges and splashes without pause. From 200-foot promontories visitors can look down on bodysurfing sea lions having as much fun as teenagers at Waikiki. You can spy into shadowy sea caves, visit an old whaler’s cabin turned museum, and wander ghostly groves of Monterey cypress. 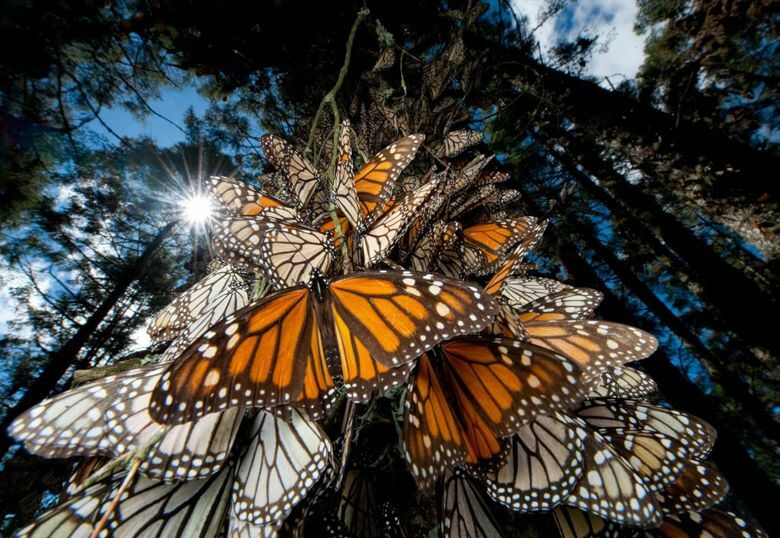 Charming Pacific Grove has more butterflies than people. “They only grow native here and across Carmel Bay at Del Monte State Forest, and in the Pebble Beach area,” said Rick Pettit, a docent on a guided walk. But Point Lobos has a cypress that’s much prettier than the famed lone cypress that’s the trademark of Pebble Beach golf resort, he added immodestly. Point Lobos is named for sea lions, who crowd some of its beaches by the dozens. Early Spanish explorers named offshore rocks here “Punta de los Lobos Marinos,” or Point of the Sea Wolves, their name for sea lions. A dozen trails wind through woods and meadows and along shorelines. The paths can be combined into a six-mile perimeter hike of up to five hours or taken in short and easy walks of less than a mile, three of which are ADA-compliant and offer jaw-dropping views. A good introduction, I found: Show up for a free docent-led walk of 60 to 90 minutes, offered most days at various locations around the park. If you don’t have your own binoculars, be sure to check out a pair at no charge from the Information Booth (they ask you to leave your car keys). I joined Pettit on the .8-mile Cypress Grove Trail, one of the park’s most popular walks. If a tree could do tai chi, it would be the bendy-branched Monterey cypress. It once grew naturally in a much wider range but withdrew to these fog-shrouded headlands as the climate changed with the close of the Pleistocene epoch 15,000 years ago, I learned. Beneath the live canopy are gnarled dead, gray branches cloaked in Old Man’s Beard, also known as lace lichen. We soon stepped to the edge of sun-drenched cliffs and those spectacular views out to the Pacific and across Carmel Bay — where, sure enough, fog was creeping in from the north. The park is a rich mix of interesting geology — its granite rock was once attached to the southern Sierra — and human history. The preserve’s Whalers Cove was the site of a whaling station from 1862 to 1879, along with an abalone cannery and a granite quarry said to have supplied stone for the San Francisco Mint. Learn more at the whaler’s cabin, originally built by Chinese fishermen in the 1850s, and an adjacent Whaling Station Museum.